Prev Easy Superhero Tank Tops for Halloween Next Minecraft Creeper Green Jack O’ Lanterns! You knew we weren’t going to just let the Candy Crush Saga game crazy go by without making a kids Halloween costume for it, right? Of course, not! We never let trends die if we can’t have a little crafting fun with them first. What better way to maximize on a trend than create a Halloween costume! Basically we made a sandwich board out of the Candy Crush game. You could easily modify it for any game you might be obsessed with. Minecraft? Jewelquest? Angry Birds? Does anyone play those anymore? First you’ll want to plan out your design. Make a quick grid by dividing up your cardboard into equal squares. For us that ended up being five squares across and six down but it really doesn’t matter how you set up your grid, since as you know from playing the game, the boards come in all sizes. 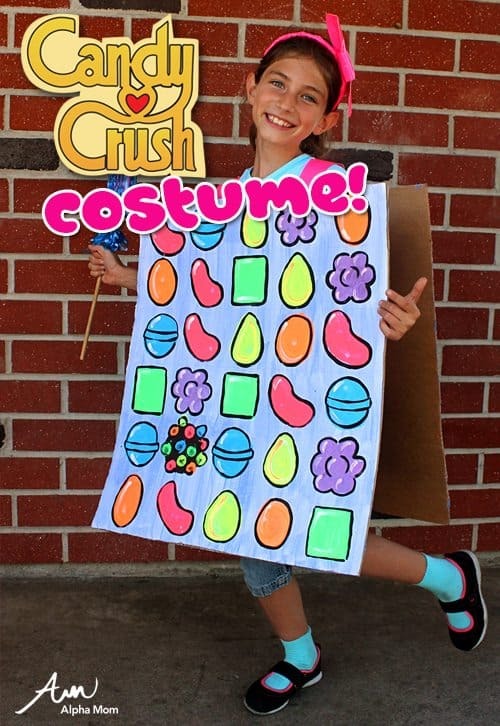 Just make a board that will fit your Candy Crush costume wearer. Next, paint your boards with the background blue color. The inexpensive washable paint we used was somewhat translucent which was helpful because the pencil lines showed through for drawing in the candies later. After the background paint has dried, paint on your Candy Crush sweets. 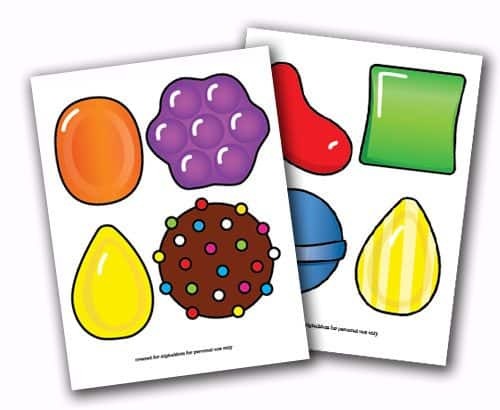 If you’re not the world’s best painter and you have plenty of toner in your ink jet printer you might opt to print out our handy Candy Crush candy printables instead. Or just print out one set for reference. If you are painting, here is a quick artist’s cheater tip: Don’t stress about the paint too much. Just blob on the colors and then go over them later with black paint and a thin paintbrush. Black outline covers a multitude of screw-ups and you don’t have to cover every little rough edge. Just outline it roughly. If a bit of color shows up outside the black line don’t sweat it. I think it looks cool personally when the paint looks a little “out of registration.” Then add some dabs of white paint in the upper left corners to look like glistening highlights and you’re done! Painter Schmainter. Do this twice and you’ll have a front and a back for the sandwich board of your Candy Crush Halloween costume. Adding the straps for this costume is a super cinch. All you need is some duct tape and a stapler. Take two pieces of duct tape about ten inches long and stick them to each other sticky side to sticky side. Getting it on there evenly might be a little challenging, but you can do it. Then repeat for the other side. Now you’ll have two strips that are going to be your sandwich board straps. Staple them to the candy crush boards and you’re done. If you’re worried about your staples holding, you can add some more duct tape for reinforcement. Add an over sized lollipop and a brightly colored bow for your hair or a neon cap (a nod to Candy Crush characters, Tiffi and Mr. Toffee) and you’re ready to hit the sidewalks to score some real candy on Halloween!